In March 2018 I was a panellist at a Green Brexit conference - our theme was 'Is a Zero Carbon Future Possible? The video is below. I come in at 8:34 and 24:56 and 39:05 but the whole session is interesting. The point of this conference was to explore how Brexit could be a positive green step away from the distortions, waste and environmental degradation that the Common Agriculture Policy has brought it its wake. The conclusion was the there needs to be an overarching commitment to the environment that legally binds all future UK governments of whatever political colour. My message was that the one thing that makes a lot of wishes come true is to reward people who take carbon out of the atmosphere. The atmosphere heated up at 39:05 when Michael Liebreich called me out for seeking a universal and equal price for all carbon - he called it 'utopianism' and naive. Maybe he's right, in which case we are all going to die. Please click here to see video clips of the Prince of Wales, Patrick Holden and myself during the conference, which was organized by The Sustainable Food Trust. It aimed to develop an agricultural perspective on the ideas propounded in the book 'Harmony' by HRH The Prince of Wales and Tony Juniper. We are indeed ‘billion year old carbon’ – the average person of about 80kgs/176lbs contains about 15kgs/33lbs of carbon. That ancient carbon is in our bones, our muscle, our fat and our bloodstream, as carbohydrate, fat, protein and other compounds. The carbon in our bodies may have been previously in soil, in trees, in charcoal, in dinosaur turds, in mosquitoes, in honey... It was everywhere before it ‘reincarbonated’ in us. Carbon is immortal. And it is stardust. A billion or so years ago a very hot star kept getting hotter. 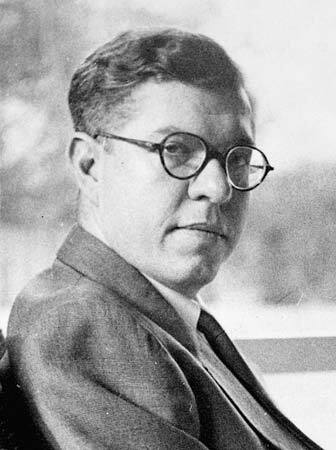 As it got hotter, it formed hydrogen, then carbon, then oxygen and then the other elements that we know.Sir Fred Hoyle, the great astrophysicist, described this as ‘stellar nucleogenesis’ – stars creating atoms. 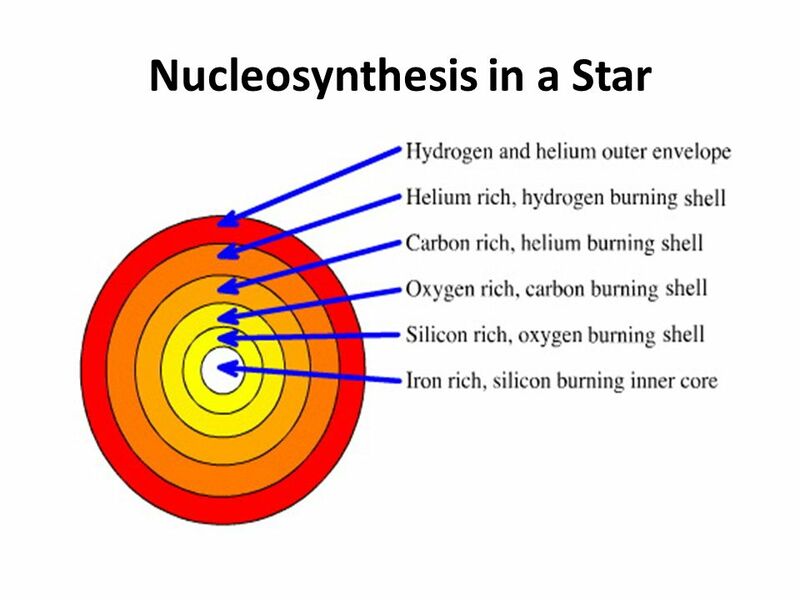 When that star got too hot it exploded, became a ‘supernova’ and blasted its carbon, oxygen, hydrogen and rock into space. Those chunks of rock and elements consolidated to form our solar system, with a sun that is still burning today with the remaining heat of the star that formed it a billion years ago. Carbon is a promiscuous atom, it has 4 points where it can ‘mate’ with other elements. That’s why there are so many carbon-based molecules and why carbon is the foundation of all living things. Where there’s life, there’s carbon. Life was fungi. That life bumbled along, depending on acid rain from the very CO2-rich atmosphere a billion years ago to break down carbon that was stored in rock. Then a miracle happened that changed everything. 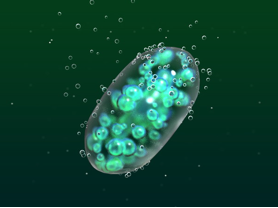 Bacteria called cyanobacteria became able to combine carbon dioxide CO2 from the atmosphere with H2O water, using sunlight energy, to make carbohydrate C6H12O6, whilst excreting oxygen. That carbohydrate was the sugar that is the basis of all living energy in plants and, eventually, in animal life too. Once this happened, one can speculate that the rock-eating fungi saw their chance and organised the cyanobacteria into chain gangs, maximising their potential to capture carbon from the carbon dioxide-rich atmosphere, then at about 95% CO2. These became algae, then simple plants, all busy making sugar to feed their own growth and, more importantly, to nourish the growth of the fungi that created them. The fungi worked with other microbes in the soil, thriving on the sugar coming from the plants and delivering back to 'their' sugar-making plant all the mineral nutrients that they needed to grow. Plants died and decomposed. Fungi and bacteria died and decomposed. The carbon-rich detritus of their existence rotted down to become what we know as ‘soil’ – a most precious resource because it is the perfect habitat for fungi and bacteria and a rich source of recycled nutrients for plants. This soil built up over millions of years, producing rich plant growth that eventually could support the large life forms such as dinosaurs and brontosaurs that existed in the ‘Carboniferous’ age. This was the soil that early pioneers found in the American Midwest, rich in organic matter that ran very deep thanks to the 3 metre roots of prairie grasses. When my great grandfather began to plough virgin prairie in Nebraska back in 1885, the soil on our farm contained over 100 tonnes of carbon as organic matter (organic matter in soil is approximately 50% carbon). By the time I was born in 1944 this was down to about 20 and now it is closer to 10, totally dependent on fertilizer and pesticides. Farmers are frugal, on our farm we grew and processed almost all the food that we ate, only buying in commodities like flour, salt, sugar and soap that we couldn't make on the farm. Old calico flour sacks were washed and recycled as clothing, overalls for the boys and dresses for the girls. Some enterprising flour companies printed pretty patterns on their flour bags when they realised this was happening. My mother and her sister Thelma wore Nell Rose flour sack dresses. "We didn't know what we were doing because we didn't know what we were undoing." What we were undoing was all the decomposed plant matter that had been accumulating ever since those first Cyanobacteria sped up the process of life on Earth. The destroyed soil lost its water holding capacity and lost its structure and integrity. 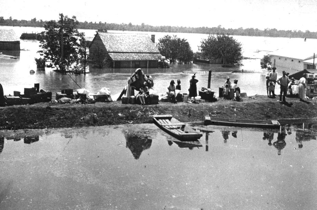 The result was the great Mississippi floods of 1927 when the river was 60 miles wide from April to October, sparking the Great Migration of African-Americans to northern cities as their farms were submerged for half a year. Then in the 1930s the Dust Bowl triggered another migration, of "Okies" from their farms in Oklahoma, Kansas and western Nebraska as their farms became submerged in dust and dirt. Richard St. Barbe Baker, an Englishman who founded Men of The Trees in 1926 and was a founder member or the Soil Association, helped restore the broken soils of the Midwest. Operating under the banner of President Roosevelt's Civilian Conservation Corps he oversaw 3 million men who planted 10 billion trees between 1933 and 1940. (These men also made good soldiers in WW2). Tractors also played a destructive role, they could plough twice as deep as a horse-drawn plough, bringing up fertility and carbon from deeper in the soil. My Uncle Floyd (pictured with me in 1947) still used horses to draw his 8-row planter because horses didn't compact the soil. Tractors did, weakening soil structure. 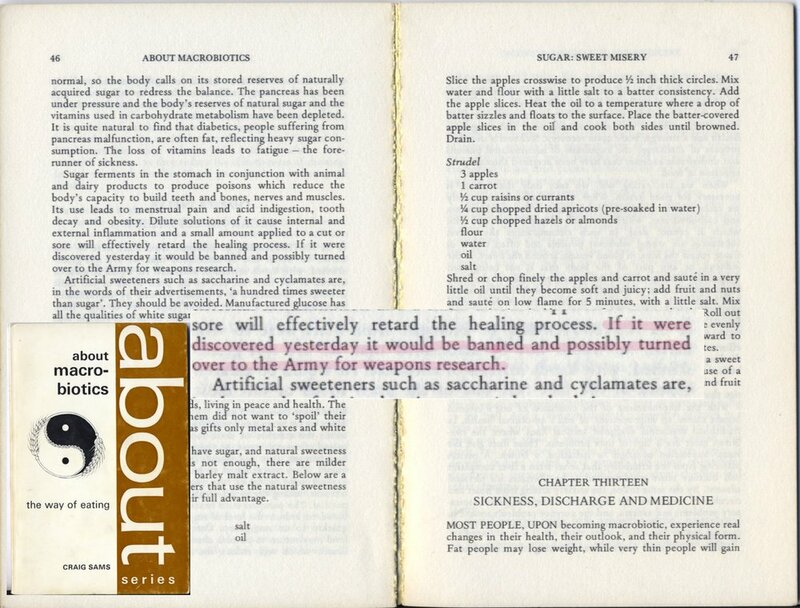 Eve Balfour collaborated with Dr. Innes Pearce who had shown at the Pioneer Project in Peckham that low income families did much better if they understood the basics of good nutrition and domestic hygiene. Together they formed the Soil Association in 1947 on the premise that good farming would produce heathy food to nourish healthy people and create healthy societies. My introduction to organic food and healthy eating came via the Japanese guru Georges Ohsawa, author of Zen Macrobiotics. I imported the books to the UK and sold them via various bookshops. I sold brown rice snacks at the UFO Club, where the Pink Floyd were the house band. 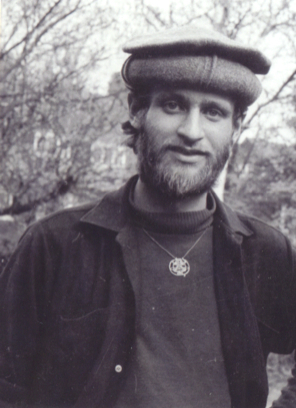 In February 1966 I opened a restaurant in Notting Hill to spread the macrobiotic message. In 1968 my brother Gregory opened Seed restaurant, our larger restaurant in Bayswater, London. Like the Stoics mentioned in the Prince of Wales’ book "Harmony" we believed in "an attunement between human nature and the greater scheme of the Cosmos." We saw this through the prism of Daoist yin and yang philosophy and saw it as the key to a long and happy life ('macro' = 'big, long', 'bios' = 'life'). When we launched a range of macrobiotic food products in 1970 we branded them "Harmony" with a trademark that was a Yin Yang symbol with leaves and roots. The company went on to become Whole Earth Foods a decade later - unfortunately 'Harmony' was a brand we couldn't register in our key European markets. When I launched Whole Earth cornflakes in 1997 a friend Dan Morrell, who had founded Future Forests (later to become the Carbon Neutral Company) asked me if I'd like to take the corn flakes 'carbon neutral' - a term he originally coined. . He then commissioned Richard Tipper of the Edinburgh Centre for Carbon Management to measure the carbon footprint of the cornflakes. The UN has said that we only have 60 years of farming left. Farming generates more than a third of the annual increase in greenhouse gas. Volkert Engelsmann of IFOAM has calculated that we are losing farmland at the rate of 30 football fields every minute. None of these losses come from organic farming, which is restorative and regenerative. Industrial farming wastes energy. It takes 12 calories of fossil fuel energy to produce one calorie of food energy. A farmer with a hoe uses 1 calorie of human energy to produce 20 calories of food energy. On a calorie-for-calorie basis a farmer with a hoe is 240 times more carbon efficient than a farmer with lots of equipment and inputs. More than 30 years of trials at the Rodale Institute farms in Pennsylvania show that organic farming can sequester 1 tonne of carbon per annum. They have also shown that once the soil is in good shape, the yields match those of industrial farming. There is an effort afoot to attempt to bring market forces into bringing an end to this potentially disastrous loss of viable farmland. Part of this is to attempt to appeal to the self-interest of companies like Unilever and General Mills whose supply chain will suffer if farmland becomes unviable and unavailable. The French National Institute for Agricultural Research published a report in 2015 that stated that if farmers could sequester 4 parts per 1000 of organic matter, that’s 0.04%, every year in their soil that would be enough to totally offset the annual increase in greenhouse gas emissions that is causing climate change. That’s without counting any transition to solar, wind or greater energy efficiency. As a result the French National Assembly voted a carbon price of €65 per tonne to take effect in 2020 and to include agriculture. French Agriculture Minister Stéphane Le Foll then announced his ‘4 per 1000’ initiative which became part of the Paris Climate Agreement. It was endorsed at COP 22 in Marrakech and 36 countries so far have signed up to participate in restoring soil, the capital base of every nation. The Prince of Wales co-authored a children’s book called ‘Climate Change’ that shows how carbon goes into the atmosphere and how it comes back into the earth and the sea. The net annual increase is 16 billion tonnes. A 3000 hectare biodynamic farm called Fattoria La Vialla in Tuscany Italy has its carbon measured every year by a team from the University of Siena. La VIalla are sequestering ‘7 per 1000’ every year. If everyone farmed like those 3 brilliant brothers in Italy, whose farm is roughly 1/3 pasture, 1/3 forest and 1/3 everything else (grape vines, cereals, fruit, vegetables), then we would not only cancel out the 16 billion tonne increase in CO2 but would see a 12 billion tonne reduction every year. Additional benefits would be greater biodiversity, cleaner water, less risk of drought and flooding and safer food. (Their wine is pretty awesome, too). Going beyond stopping degeneration is the regeneration movement. This includes: Regeneration International, an offshoot of the mighty Organic Consumers Association in the US; the UN Food and Agriculture Organisation FAO; Soil and More (Netherlands); People 4 Soils (Slow Food movement); and Save our Soils (UK). Corporations like General Mills are taking strong initiatives. They have 100,000 hectares of land from their supply chain to be organic by 2020 as part of their carbon reduction policy. We still burn wood. There is a false virtuousness to burning wood. 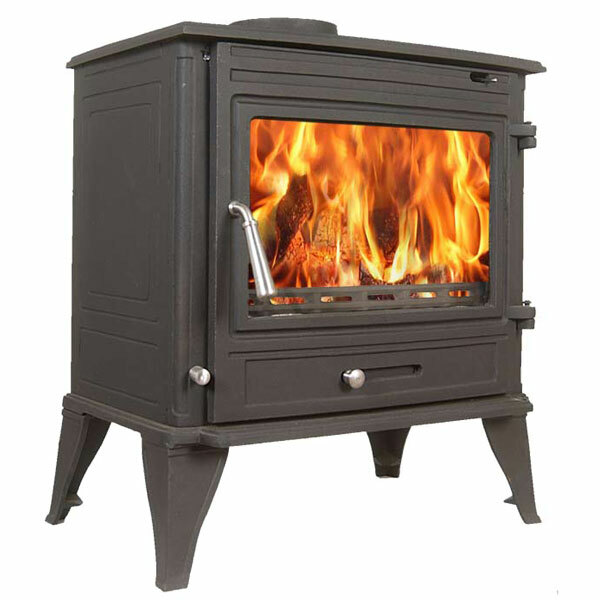 200,000 wood burning stoves a year are sold in the UK alone. Wood smoke is more harmful to health than smoke from coal, oil or gas. It takes a tree 50 years to sequester the carbon that is then consumed in a wood burning stove in 50 minutes. If a replacement tree is planted, will take 50 years to take that carbon back out of the atmosphere. Wood has the resilience of steel and the load bearing capacity of concrete. 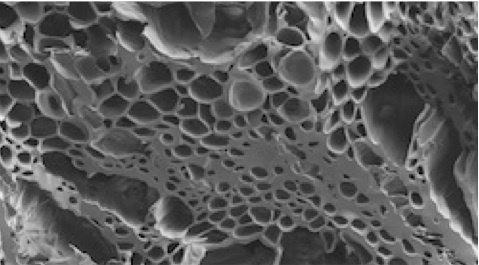 'Glulam' and other new wood technologies mean that wood can be used in 20 story buildings ('plyscrapers'), sequestering the embodied carbon in the wood for centuries. We should never burn wood, it's a terribly inefficient waste of carbon. Biochar, or charcoal made from wood, is a way to convert wood by-products into a carbon rich substance that can be put in the soil and will stay there for decades or even centuries. 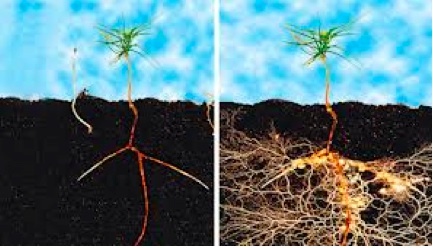 It dramatically increases the population of beneficial microbes in soil, delivering a healthier plant immune system, increased water retention and reduced loss of nutrients from leaching. It is the best use for woody material that is not suitable for building or furniture making. It is proven to help restore degraded soils and make them fertile and fit for farming again. There are many examples of its benefits: tomato growers use it to combat plant diseases and increase yields; it cures honey fungus, ash dieback, chestnut blight, phytophthora and other tree diseases; it helps cocoa farmers overcome the devastating impact of black pod. Stockholm uses it for all their new urban tree plantings as it enhances survival rates. In Qatar the Aspire Park now use it for all their new tree plantings, with gratifying results. Biochar in soil protects the beneficial microbes that are part of a plant’s immune system, its food supply and it’s water supply. Farming and forestry would be transformed if carbon pricing were to be introduced for their activity. People would plant trees instead of growing wasteful biofuels. Prairie grass would replace corn in the Midwest. Farmers would adopt regenerative methods such as organic and biodynamic farming. An 'interest' payment on the actual level of soil carbon on the farm. This would be effective at around 10% annually. A typical organic farm would benefit to the tune of approximately £100 per hectare and an industrial farm would have to pay a carbon tax of as much as £100 per hectare. Farmers would change behaviour overnight and agribusiness behemoths like Monsanto, Bayer and John Deere would have to rethink their business model. Taxpayer-funded subsidies to farming could be largely phased out as carbon markets would trade the carbon credits. Farmers could also insure against catastrophic events such as flood and drought that might impact on their soil carbon. However, farming with carbon in mind would reduce the likelihood of such damaging events. 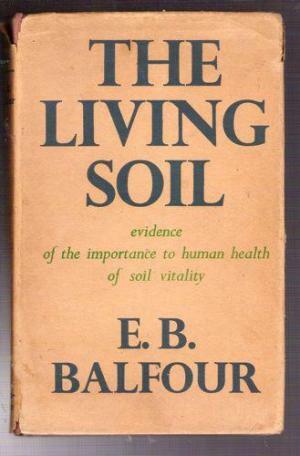 Soil is Nature’s capital and the foundation of all life on Earth. Capitalism is about valuing capital and pricing it. Capitalism has failed to deal with carbon because industry, transportation and farming have been allowed to pollute freely at no cost. All other forms of pollution are nowadays strictly controlled for wider social benefit. It is time for carbon to be priced and traded like very other important commodity. We can get 'back to the garden' - the Garden of Eden. We just have to price carbon and change the way we farm our beautiful planet. The curse of nuclear power and its associated mass extermination weaponry has hung over the heads of several generations since Hiroshima and Nagasaki. We were conned by promises of 'electricity too cheap to meter' when the first British nuclear plant was erected at Calder Hall (renamed 'Windscale' then renamed 'Sellafield) but in fact it now costs more than wind or solar. Now Toshiba, who suicidally bought the Westinghouse nuclear business, is consulting bankruptcy lawyers. Electricité de France, 85% owned by the French Government, is in terminal decline, with a share price ten percent of historic highs. This still leaves the question of who will pay to clean up the toxic mess from places like Fukushima and Chernobyl and, eventually, Hinkley Point. The militarists who promoted nuclear power as a cover to get weapons grade plutonium? The politicians who were wined and dined and voted this madness through? The insurers who backed these projects under government guarantees? The investors who relied on taxpayer money to guarantee the huge investment required? Or the taxpayers of today and tomorrow and centuries to come who will have to protect civilisation from this toxic blight on everyone's future? I first met Larry in 1967, when he was in the dance troupe Exploding Galaxy. They would perform free-style dance at the weekly hippie gathering, the UFO Club, in between sets by the Pink Floyd. They helped encourage everyone to ‘freak out’ their dancing style. The Exploding Galaxy were part of a commune which lived in North London and took their name from a painting by Larry of the same name. They were immortalised in the book 99 Balls Pond Road by Jill Drower, one of the communards. Born in 1945, Larry spent much of his childhood in Baghdad, where his father Philip worked with Shell Oil. His exposure at an early age to Islamic art and architecture and its intricate geometry became a lifelong influence. Later he went to boarding school in England and then to Croydon Art College. Larry's art owed much to his art school mentor Bridget Riley. He created more structured geometric forms than found in her work, while still generating the vibrational effect that results from staring at Riley's paintings, the 'op art' experience. 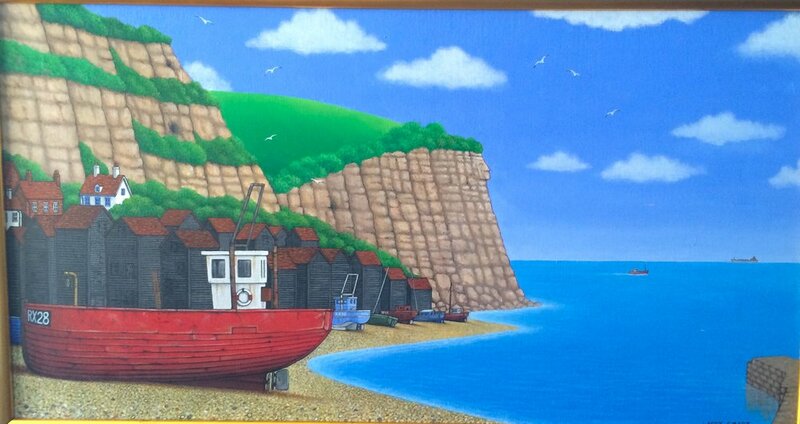 Larry's paintings were more symmetrical and colourful while still achieving and even enhancing the same ‘op’ effect. His circular mandalas were an aid to meditation and awareness heightening, oscillating when you concentrated on them. At psychedelic events such as the UFO Club, Summertime in the Wintertime or the 14-Hour Technicolor Dream, Larry's mandalas would be the focus of light shows created by John Bloomfield. The impact of the mandala was enhanced with pulsing light, increasing the op-art psychedelic effect of looking at his paintings. His mandalas were bought by Jimi Hendrix and George Harrison and funded his meals tab at the vegetarian Baba bel Poori restaurant in Bayswater. In 1967 he married Carol Grimes, the blues and jazz singer who later performed with Lol Coxhill and the band Delivery. Their debut performance was at our macrobiotic restaurant Seed in 1969. One of Larry's mandalas adorned their album cover. Larry produced work for Apple Corps and subsequently produced silk screen prints representing John Lennon, Frank Zappa, Jimi Hendrix and Bob Dylan. In 1970 George Harrison invited Larry to paint murals at Friar Park, his vast mansion near Henley. Regrettably these works, completed over a year, appear to have been lost. Patti Boyd, his first wife, is unaware what happened to them. Olivia Harrison cannot remember ever seeing them. Larry also produced landscapes with towers and minarets rising on high peaks that imagined a fantasy world reminiscent of Arabian Nights. After his break up with Carol the mood of his fantastical landscapes changed and led to a series of paintings showed crumbling edifices, with cracks in the walls and broken towers. Larry was commissioned by the owners of country houses to capture the look of their houses in his distinctive magical realist style, populating the grounds with cricket or croquet players in Edwardian or Victorian dress. The intensity of the acrylic colors he used gave a special vibrancy to these paintings and, indeed, all of Larry's work. He also spent some time in Granada, painting the gardens of the Alhambra. In 1968 Larry, myself and Jordan Reynolds spent a week in Marrakech. It was a bit of a blowout for us all, partying until late and then recuperating by the hotel pool the following day. Larry was captivated by the beauty of the architecture and art of the city and the high plateau landscape of the region. He and his new wife Karen subsequently visited Marrakech frequently and Larry began to capture on canvas the fountains, palaces, gardens and mosques of the city. This was a time when the old riads of Marrakech were being restored and the new owners would commission Larry to capture the intricate tiling and designs of the courtyards and fountains of their villas. Larry's bible at this time was "Arabesques" - an art book by Jean-Marc Castera that explained in great detail the mechanics (and cheats) of, for example, creating a 128-point star and integrating it into a pattern of interlocking stars. Larry's understanding of how this art was created by the original tilers and designers was reflected in his canvases, which draw the viewers eye inwards and then back and from right to left and left to right. He saw this work from the inside out and captured its depth of geometrical and mathematical thinking in a way that an artist without that understanding would find challenging. In Tangiers he stayed with Philip Arnott, who introduced him to clients in Marrakech and who now deals art from the Lawrence-Arnott galleries in both cities. In the late 1980s and 1990s Larry worked closely with me on a number of projects. I would brief him on a new organic food product project such as whole grain corn flakes, blue corn flakes, muesli, baked beans, Blaisdon Red plum jam or hummus tahini and he could create a painting that formed the basis for the label or carton artwork. He created a landscape of the digestive system that provided the perfect packaging for our All Your Fibre breakfast cereal. By then Larry had settled into a pattern of spending 3 months in Marrakech, then London, then Marrakech again. He would complete commissions in his London flat for clients in Marrakech, then deliver them a few months later and obtain new work, which he would complete in Marrakech or take back to London to complete. His paintings were also sold to visitors to La Mamounia hotel, the pre-eminent and historic establishment in Marrakech where Winston Churchill often stayed and painted. Larry was a regular visitor to our house in Hastings and painted scenes that captured in detail the shape and symmetry of the Old Town's tiled rooftops, the patterning of the wood on the boats of Hastings fishing fleet and even imposed Arabic- patterned arches over a view across the Old Town from the nearby allotments, where he mischievously slipped in a cannabis plant to a lush display of asparagus, marrows, leeks, lettuces and other garden produce. In 2004 a work colleague showed me an advertisement in Record Collector magazine for Larry's poster of Jimi Hendrix, selling at £350. I showed it to Larry and he contacted the vendor who proposed printing a limited edition of the poster, to be signed by the artist. The posters were marketed in 2005 and are now prized collector’s items. Larry signed the limited edition but then died a few months later. The Victoria and Albert Museum hold Larry's Jimi Hendrix silkscreen poster in their permanent collection. They used his 'Kaleidoscope Eyes' (hippie slang for acid-tripping) poster on the publicity material for their wonderful 'Revolution: Records and Rebels 1966-1970) exhibition that runs from September 2016 until February 28 2017). The revival of interest on the 50th Anniversary of the 1967 Summer of Love has increased awareness and appreciation of Larry Smart's work. Larry captured the essence of the time and his work informs any understanding of the aesthetic that reflected the transformation in social and political thinking that emerged from the experience of the late 1960s and its aftermath. A Larry Smart limited edition A1 silk screen print, Kaleidoscope Eyes is now available - only 300 printed, please order from here. I was delighted to give the keynote speech at a dinner to mark the opening of a new exhibition about the '60s - 'You Say You Want a Revolution?' at the Victoria and Albert museum. Is it time for investors to dump Monsanto, Syngenta and Bayer? The UNFCC has launched its '4 per 1000' initiative based on data from the French National Institute for Agronomic Research that shows that just by increasing overall the carbon-rich organic matter of soil by 0.4% per annum we could completely and totally offset all our annual GHG greenhouse gas emissions. The farming methods that can take carbon out of the atmosphere and lock it in the soil include big reductions of nitrate fertilisers and fungicides. Just doing that will make a difference as they represent a 15% contribution to annual GHG emissions. The rest comes from 'agroecological' practices, mostly pioneered by organic and biodynamic farmers, that are now tested, refined and proven to be competitive in yield with industrial methods of farming. They do not deliver high revenue streams to agribusiness companies and they also do not externalise all sorts of other costs onto society. These biggest cost is greenhouse gas emissions as that's the planetary existential threat. But the personal and social costs are pretty costly, too: pesticide residues in food, soil erosion, dust storms, water pollution, flooding, biodiversity loss, toxic algal blooms and an archaic subsidy system that has the hard-working poor subsidising rich landowners in the name of 'cheap food.'. But forget about that, just concentrating on the carbon dioxide equivalent emissions from farming is enough. There are plenty of untested technological solutions like mirrors in space or the delusion of Carbon Capture and Storage (CCS) that you can pump carbon dioxide into old oil wells and somehow convince yourself and everyone else that it will stay there. The beauty of what I should like to call Soil Carbon Capture and Storage (SCCS) is that with soil carbon, what goes in the ground stays in the ground. All it needs is the right price signals. 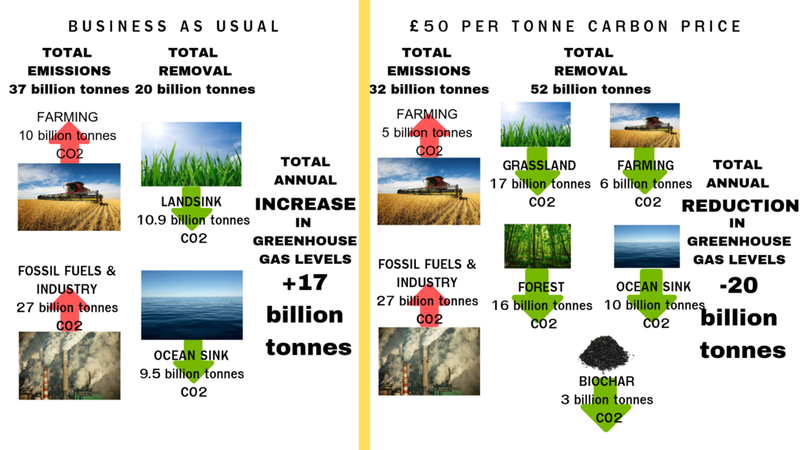 If carbon has a value then the farmer who reduces emissions and increases sequestration will be rewarded. When carbon has a value it will be traded and there is no need for complicated and inequitable government farm subsidy policies that punish environmentally responsible behaviour. SCCS farmers will sell their carbon right alongside their corn and beans. Capital Payment: This is a payment to a farmer for the net annual increase of carbon in the soil. Rodale's research has shown that an organic farm can sequester 2.5 tonnes CO2 per hectare per year. There are 1.5 billion hectares of farmland and 3.5 billion hectares of pasture. For farmland alone, 1.5 billion ha. times 2.5 tonnes is 3.75 billion tonnes of CO2 per annum. Conversely, a farm that continues to reduce its soil carbon annually would have to pay for that reduction. Soil Interest Payment - This would be an 'interest' payment of the market price of carbon based on the amount of carbon that is already in the soil, the 'deposit' so to speak. Avoided emissions payment - emissions include fossil fuels and the emissions involved in the manufacture and application of fertilisers, pesticides and agricultural equipment. How does it work in practice? Let's say a farmer has 100 hectares of land. The carbon price is $50 per tonne CO2. There are already 60 tonnes of CO2 as soil organic matter per hectare. The farmer adds 2.5 tonnes in one year. What is the annual carbon payout? What about the industrial farmer? If yields are equal and input costs are comparable then this is a significant edge in competitiveness in favour of the agroecological or organic farmer. That's $250 per hectare. About what a farmer gets nowadays by way of government subsidy but, instead of it coming from the taxpayer and the farmer acting as a conduit that channels it to agribusiness the payment is funded by the carbon markets and most of the money stays in the farmer's pocket. Michael Pollan's made a lovely video that tells the story of soil carbon. And Deborah Garcia's film 'Symphony of the Soil' is certainly worth watching to get a full understanding of the real underfoot magic of our existence. And the Financial Times published my letter on December 18th 2015 that was a warning to investors not to get caught in a meltdown of agribusiness shares similar to what's been happening with fossil fuel company shares - the writing is on the wall for businesses that generate high greenhouse gas emissions - there's no hiding place any more. The Paris talks have tipped the balance. This morning, for breakfast, I went into the garden with a couple of slices of bread slathered with mayonnaise and a rice cake smeared with Jersey butter. Then I proceeded to pick from my winter salad garden: lamb’s lettuce, French parsley, various Japanese winter veg including mizuna and two frilly but intensely hot mustardy greens, land cress (a thicket self seeded from a single plant earlier this year), lettuce, winter purslane and, for a touch of the bitters, artemisia – wormwood. I added a leaf of radicchio from plants that have sprung up through the brickwork of a path. Just as we think of ‘food miles’ there is a parallel concept of ‘food days’ from harvest to consumption. 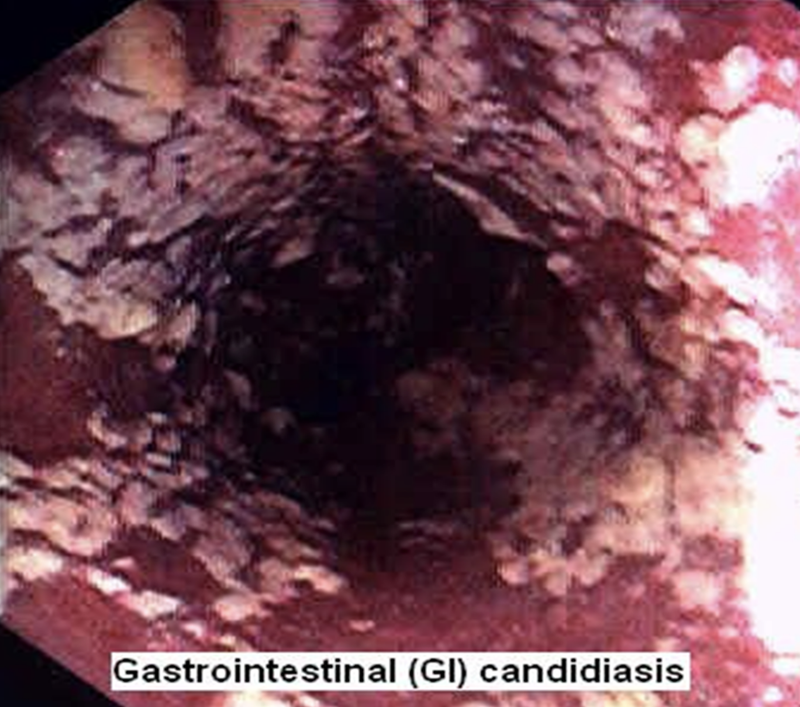 In this case it was ‘food seconds’ – the leaves barely knew they had been plucked before they disappeared into the welcoming warm darkness of my esophagus, still brimming with vitality as they headed for the acid bath of my stomach. The garden owes everything to Rocket Gardens Winter Salad Collection, a superb collection of cold-tolerant plants that were delivered to me back in September, to get established before the cold set in. They haven’t been tested by frost (well, a very light one a few weeks ago) but my experience has been that my biochar-rich soil has such an active biology that the warmth it gives off acts as underfloor central heating for the plants. Soil is everything and I am lucky to have Carbon Gold at my fingertips, continually discovering new aspects of the joys of biochar gardening. But enough about the soil, it’s the variety that gets me every time I have my salad breakfast. Here they are, sharing a plate with a buttered rice cake and the lamb’s lettuce growing just behind. But read on for the individual varietals and pictures. I love the light mucilaginousness of winter purslane, with its spade-shaped leaves that look like they’ve escaped from a deck of playing cards. Then there are the red chicories – radicchio and rosso de Treviso, both squeezing through the brick path. These provide a crisp bitterness. The Japanese Red Frills Mustard leaves are hot and mustardy and satisfyingly crunchy. Here are the purple ones, finding space between the turnips and the spring onions. The Lamb’s Lettuce miraculously replaces removed leaves almost, it seems, overnight. Light in flavour and texture. French parsley does the same, endlessly offering up new leaves to replace those plucked earlier. Here it is in the foreground, with emerging Babbington’s leeks just behind. Mizuna rounds it out, though it seems to be struggling more with the cold than the others. A dab of Artemisia is always a good digestive tonic, but very bitter, so I get that down first and then follow with the sweeter and more pungent leaves.